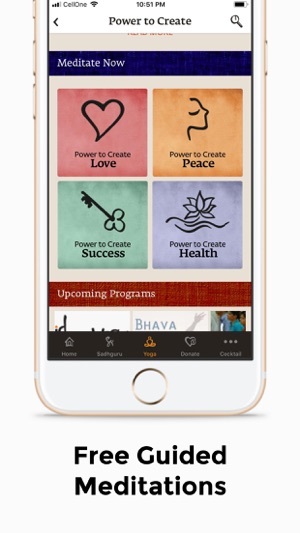 Connect with Sadhguru and Isha on your mobile with the official Sadhguru App! 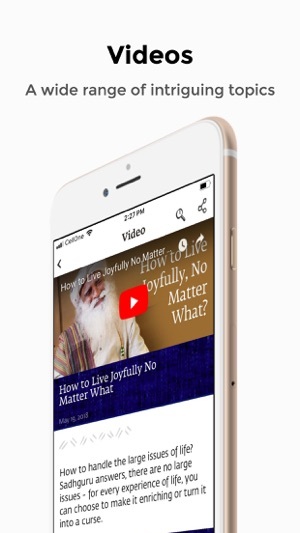 Through automatic notifications, you can read the latest articles by Sadhguru, watch the newest videos, and listen to Sadhguru's podcasts. 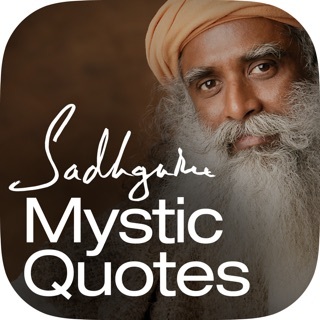 Stay in touch through Sadhguru’s daily Mystic Quotes and the weekly Sadhguru Spot. 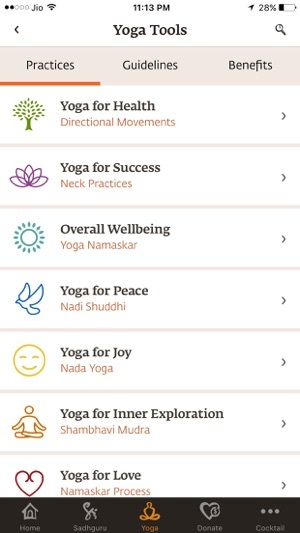 And for all those new to yoga, you can learn Upa-Yoga and meditation right here on the Sadhguru App! These free meditation practices will help you relax, drop your stress and anxiety, and discover a lasting calm that comes from within, in just a few minutes a day. Keep up to date with Sadhguru’s schedule and all the recent events at the Isha Centers. For visitors to Isha Centers, we have included a live map, so that you can get driving directions with just one click. •	About Sadhguru – Learn more about Sadhguru. •	Sadhguru Videos – Watch the latest videos on a wide range of intriguing topics. 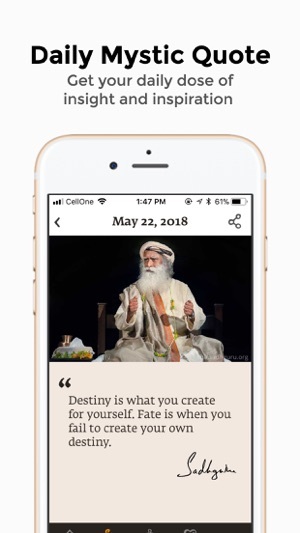 •	Sadhguru Articles – Enjoy the newest articles at your fingertips. 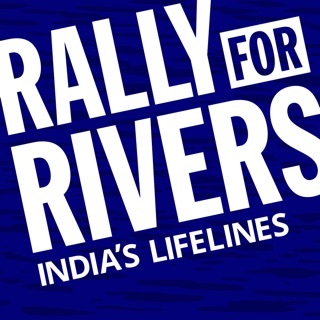 •	Sadhguru Audio – Listen to Sadhguru’s wisdom wherever you are. 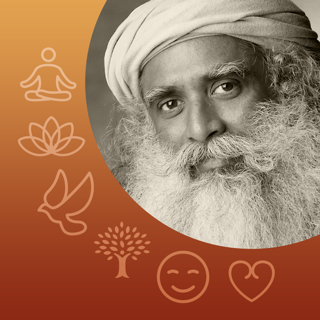 •	Sadhguru Spot – Don’t miss Sadhguru’s weekly personal updates from around the world. •	Daily Mystic Quote – Get your daily dose of insight and inspiration. Yoga For Health - This Upa-Yoga practice is a simple way to activate the energy nodules in your joints and exercise your muscles, bringing ease to the whole system. Yoga For Success - In evolution, a vertical spine corresponds to a leap in capability. This simple practice keeps the spine healthy and active, and can do wonders. Yoga for Overall Well-Being – Yoga Namaskar, a simple and powerful system, activates the lumbar region of the spine and strengthens the muscles along the spine, preventing the spine’s collapse due to aging. Yoga for Peace - The Nadi Shuddhi practice cleanses the nadis – the pathways through which pranic energy flows – resulting in a balanced system and psychological wellbeing. Yoga for Joy - Nada Yoga – the yoga of sound or reverberation – allows you to utter the sounds that create an inner atmosphere of joy, making it a natural way to be. Yoga for Inner Exploration - Shambhavi Mudra is an easy, effortless process that enhances your perception and makes you receptive to that dimension of life, often termed as Grace. Yoga for Love - The many nerve endings in your palms make them very sensitive. By placing them together in a Namaskar, you can change your chemistry to foster love within. 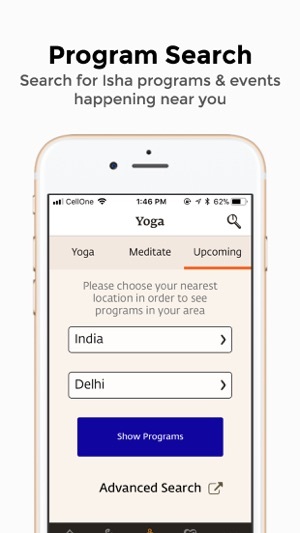 Search for upcoming Isha Yoga programs and events near you. Sadhguru Presence Time – Participate in Sadhguru’s Presence time daily at 6:20 p.m. This upgrade uses the latest version of the Youtube player. Fixes audio issues in Youtube videos. reduces crashes due to the Youtube player. It is simply a very user friendly app. Can you guys also add like a favourite button so that I can make a playlist or something that I can get back later. Thanks 🙏. 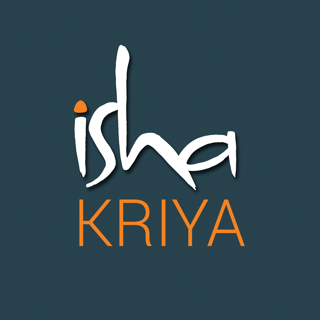 © 2019 Isha Foundation, Inc.